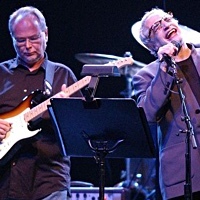 Although the jazz vocabulary is undoubtedly American in origin, with the passing of time and the evolution jazz has arguably become a pejorative term for the making of improvised music. The improvisational element reaches its logical conclusion in music that is freely improvised, that is to say music that is free of all predetermined elements and the structure of which is of the moment. Free improvisation has followed a more international path than did jazz as such in the earliest decades of its life; an outcome of this has been, to put it both crudely and with a degree of determinism, the forming of national schools of free improvisation despite the fact that what might be called the sound worlds produced through such improvisation have broken down the instrumental orders of both small and large group jazz. 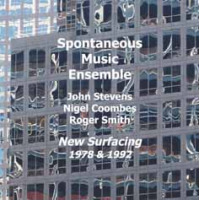 The Spontaneous Music Ensemble was the brainchild of the pioneering British drummer John Stevens and, in a way both in common with and dissimilar to guitarist Derek Bailey's group Company, the SME championed fee improvisation as a form of musical expression. With the exception of Kent Carter -playing cello here, not his more usual bass- the ensemble on Quintessence 1 & 2 is British, and the music they produce, to pursue that two-edged idea of national schools, is of the British school. Everything about the music, right down to the sheer volume of it, is the product of the moment, and a consequence of this is that the task of gauging precisely what is going on is made reasonably straightforward. Rhythm and tempo are both irrelevant to music of this kind, and such is the alertness and responsiveness of the musicians involved that the music frequently takes on a contemplative air in a way not far removed from chamber music for all of the idiomatic differences and the antithetical approach. Solos too are sacrificed in pursuit of a group ethic that makes of ultimate importance the overall sound. It would however be wrong to try to argue that what is happening here is a return to some era of jazz in which the primacy of the soloist was not of paramount importance. A previous article in this series forwarded the idea that some of Albert Ayler's later music harked back to such a time. At the same time as this music is a world away from the visceral intensity of Ayler's music, it perhaps harks back to some period of musical expression before both notation and composition. Furthermore, the kind of virtuosity on offer here is such that the music can sound like anything but the application of 'correct' technique; if anything, the responsiveness of the musicians is a form of virtuosity in itself. As it is, Evan Parker and Trevor Watts on soprano saxophones, Derek Bailey, Kent Carter and John Stevens were caught on tape in 1973 and 1974 making freely improvised music that in its approach defies the pigeonholing of time. 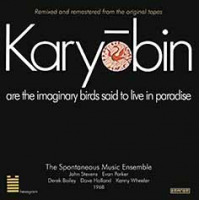 Whilst the music has its moments of stasis, they are in an odd way rendered only more noticeable by the more -and far more numerous- inspired passages that punctuate them and, on a deeper level, by the entire reasoning behind the music making. None of this however alters the fact that free improvisation in its very being continues to offer possibilities for creativity; as such, any limits are the imposition of the musicians themselves working within the framework provided by spontaneous group interaction.